We all played The Oregon Trail in elementary school during computer class when our teachers wanted a break from us. The game was produced by the Minnesota Educational Computing Consortium (MECC) in 1974 to teach school children the realities of pioneer life on The Oregon Trail. Although this game had been a staple of your elementary school life, did you ever imagine this computer game being reenacted by real people? Nowadays, no one can escape the 2016 Presidential Campaign Trail news. We can’t go online or watch TV without seeing updates about the primaries and who won which state. But, have you ever thought about how amazing it would be to see those politicians on The Oregon Trail? Hillary Clinton, Bernie Sanders and Donald Trump all decided to travel The Oregon Trail starting from Independence, Missouri. They invite Barack Obama at the last minute since he is the current president. They embark in their covered wagon and shortly after starting, they stop to hunt due to hunger pangs. “BANG” “WHAM” “POW” are the sounds of Sanders shooting a bison. 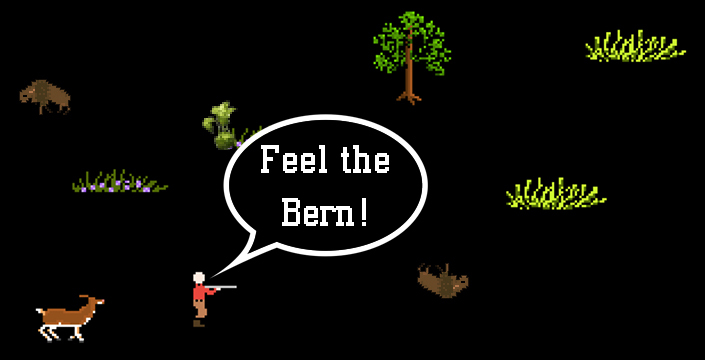 “Feel the Bern!” he exclaims as a bison falls to its death. They all gather around the fire to cook the bison meat for dinner. “This is pretty good, it tastes like chicken, needs hot sauce” says Hillary. “This is nothing. Michelle can cook some good fried chicken,” says Barack. Donald just rolls his eyes and daydreams about sleeping in one of his Trump hotel rooms. Within the next hour, Hillary starts grabbing her stomach and moaning in pain. “What’s wrong, Hillary? Are you going into labor?” asks Donald. “Are you saying that because I’m a woman? You’re sexist pig!” yells Hillary. Donald rolls his eyes again and thinks to himself that Democrats always like to think the worst. “I think that I have dysentery,” says Hillary. She drops to the ground. “Uh oh. Look what you made her do. Republicans have that effect on people,” says Bernie. “Feel the Bern!” exclaims Bernie as he stares down Donald and then turns away to walk off into the sunset. “Forget this! I wanna go back to the White House,” says Barack and starts walking East towards Washington, DC. Trump looks around and realizes that he is the only person left, besides Hillary lying on the ground. “Hmm, I guess I won the Presidential Campaign! 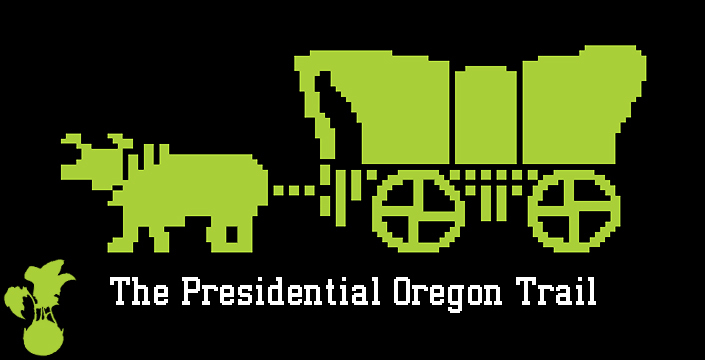 You’re all fired!” Trump gets into the covered wagon and attempts to survive The Oregon Trail on his own. The Kohlrabi is fairly sure the MECC intended The Oregon Trail game to have the majority of the members in the group survive on the quest towards Oregon. But, in the case of a presidential election, it’s a one man for himself mentality since there can only be one.